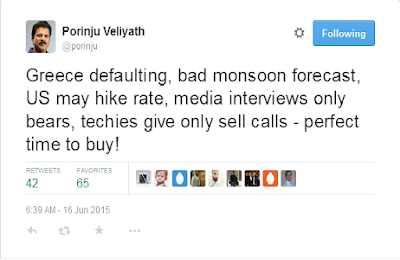 Porinju Veliyath, the head of Equity Intelligence is a person who is followed by thousands of retail investors. In the last 2-3 years he has picked up many undervalued stocks and made excellent profit to his customers. He has many twitter followers who simply try to imitate his picks and make quick bucks. Many of them have indeed succeeded as well. In June 16, when nifty was trading near 8000, Porinju Veliyath gave a buy call and smashed all technical analysts by posting above twitter message. 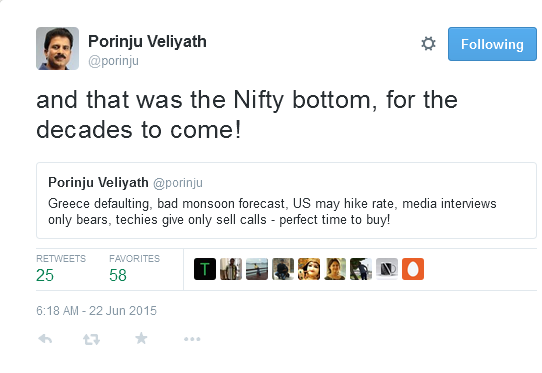 On June 22, When market recovered 200 points, he proclaimed that Nifty will never touch 8000 for the decades to come!!!. It seems like an innocent statement, but just because of that one liner, many retailers who were waiting for correction would have jumped to grab the losing opportunity in Indian stock market. A person who was always emphasizing about value buying forgot to think about the exorbitant valuations in Indian stock markets, especially in mid caps as a whole. Our humble advise to Mr. Porinju Veliyath is, You are no more just an investor, but a great Indian investor who is followed and imitated (knowingly or unknowingly) by many retailers. A single tweet by you can be a deciding factor for many retail investor's buying or selling ideas. Just have this thought in mind while you are tweeting!! We are winding up this post by pasting a real story mentioned in the investment bible - The Intelligent Investor written by Benjamin Graham. There cannot be 100% accurate prediction by anybody. It is an experience for future guidance and analysts will have more angles to predict the market and improve their vision more hereafter. Will you provide enrty prices of ashish kachollias all stocks updated in jun qtr, please.